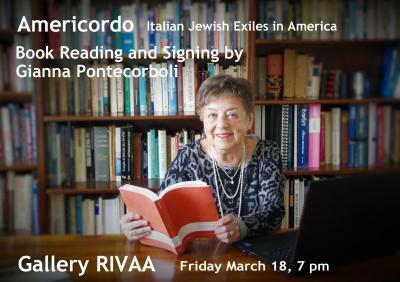 You are cordially invited to the book reading and signing of "Americordo - Italian Jewish Exiles in America" - A book by Gianna Pontecorboli, on Friday March 18th at 7PM at Gallery RIVAA. Pontecorboli's book is a long overdue account of a lesser-known aspect of the Italian anti-Jewish persecution: the exile of Italian Jews to America. You can purchase Americordo - Italian Jewish Exiles In America by Roosevelt Island resident Gianna Pontecorboli at Amazon.